Harper you are EIGHT months old today!!! You wear 6-9 month clothes and 12 month PJ's. You are a little thing but a GREAT eater. You eat three meals a day - normally Yo Baby Yogurt for breakfast, a couple of jars at lunch and 2-3 jars at night. You also snack at least once a day on puffs and water or juice. And you nurse every 3 hours still. You have started taking great consistent naps and your night sleeping has been GREAT for the last week - I'm hoping we are turning a corner! You are a wonderful traveller! You have been on several car trips, two airplane trips and of course one helicopter ride. You have been to six states in your first 8 months! You like to blow rasberries and smile after every bite you eat. It would drive me crazy but you are just so cute. We call you "pap-pa" because you remind me of my grandpa - you are such a slow eater. You have to look around after every bite. We also call you "curious george" because you are so nosy and curious. You love to look around at people and you will just stare. You are so curious about everything. You sit so good now and you just started taking your first little crawling steps. You still love the exersauser and you just jump up and down in it. You still mostly say "dad-da" but you love to babble and make noise and you are SO loud. You talk all the time - I figure you will be that kid who gets sent home with notes for "excessive talking"
I think you spend 75% of the day smiling. You have the cutest personality. I literally can't get enough of you - I will never kiss you or hug you enough. Your hair has really started to come in this month and it's blond! You also have hazel eyes. They are so big, round and beautiful. You are the most precious thing in the world to me - I think I would like to have 10 more just like you!!! The first year of your life is just flying by! I can't believe you are only 4 months from being one year old!!! You are the best thing that ever happened to your momma and daddy! We love you SO much!!!! Harper's surgery is in the morning. I'll put up a reminder tomorrow to please use that day to pray for all the children who are undergoing any kind of medical treatment - there are SO many who could use our prayers! Our little monkey will be just fine - I'll let you know how she is once we are home! Such a big girl little miss Harper is getting to be! It all just flies by so fast...sometimes I just want to hold my babies forever in hopes that they will stay this way. :) Praying that surgery goes well, which I know it will! She's such a cutie! She's getting so big =) What a precious gift you've been given! We will be praying for Harper and her mommy and daddy! She is so big now!! We will be praying for her and all the other children in need of prayer tomorrow. Praying that all goes well for little Miss Harper tomorrow and all the other children needing prayers,She is growing up so fast and I do so much enjoy seeing her pictures every day, She is a cutie !! Kelly, you are going to LOVE having these posts to look back on. I wish blogging had exsisted with my first two kids. I tried to keep up with their baby books but didn't do the best job. My "baby" (2 now) has had nearly every day of his life blogged and recorded in digital pictures. It's such a great tool for preserving memories! 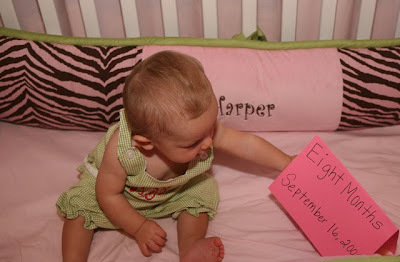 Eight months was my favorite, favorite, favorite "age" of my little girl. With my boys, it was a little older, but I still remember how darling she was then ... 14 years later! She just gets prettier each and every single day! Little Miss Harper was in my prayers last night and this morning! I hope that she is back to her cheerful self very quickly after the surgery. Sweet Harper is growing so fast! The first year flies by. I hate it, but it does. You're blessed immensely! I'll be praying for Harper tomorrow. I love the monthly updates on Harper. Her and my son are 4 days apart and it AMAZES me how much they are just a like. WOW! She is such a cutie! It's hard to believe that Miss Harper is growing up so quickly. What a blessing she has been in our lives. Will be praying for Harper AND her parents!!! I can't believe how much she has grown! She is a beautiful little girl. So glad to "know" you thru the blog world. Us SEC girls must stick together!!!! I've been praying for Harper, I know her surgery will go well! I will be thinking about you tomorrow! I will be praying for Harper. I know the surgery will go well. Happy 8 month Birthday Harper! Also I will be praying for your sweet little girl tomorrow. God has blessed her life so much already and I know He will continue to! And one more thing, we would SO be friends if we knew each other in real life! Praying for you and others tomorrow. She is so stinkin' cute...I can only imagine her personality. Hope y'all are feeling a little better today!! Praying for a sucessful surgery and you and Scott to kick your colds good-bye. SHE WILL BE IN MY PRAYERS!!! MY SON HAD TO HAVE HIS TONSILS OUT AUG 13 AND HE WILL BE 2 OCTOBER 1 SO I KNOW YOU ARE WORRIED SHE WILL DO JUST FINE! Happy 8 months HARPER!! You look great. 4 months and you'll be a Year. You are a true Blessing. I love your blog - its the highlight of my day! Praying for you today and everyday more especially today for your surger. GOD BLESS YOU, MOM and DAD. Praying for sweet Harper today ... and her Momma and Daddy, too! Have decided to take todays praying request a step further, as this has been an emotionally trying time with my grandma's health. I am fasting today so I can spend more time praying for children undergoing surgery AND for those of all ages who suffer in any way ... along with the family's that love them. I currently have a candle lit for Harper, and will blow it out when I read an update on your blog. Praying that "lil' monkey" has a speedy recovery! Wow, after I saw that the sign said "Eight Months" I did a double-take! I can't believe it. What a lovely baby...and I can tell you are so in love with her! I just found your blog and read it for 45 minutes on Sunday when I finally had to make myself get off the computer! I was wondering where you got the zebra leggings and who did your Christmas cards last year. I have a 5 month old and I just love looking at all of Harper's outfits and accessories. I just love having a little girl that I can play dress up with! Oh my god..she is so stunning. Absolutly adorable. I love your blog..Hope you feel better! WOW! 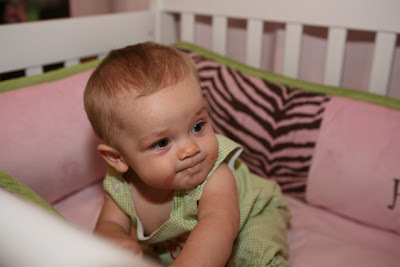 Looks like it's time to lower that crib mattress!! She is getting so big (well, big for HER). My daughter was a tiny thing with a big appetite too!! So sweet of you to think of others on Harper's surgery day. Even minor surgeries are big when they happen to OUR children! Praying. Thanks for the e mail about the cookies. I will wait to hear from her! It's so much fun watching her grow through the months! She is growing so fast and is becoming more adorable each day! I'm thinking about your family today. I'd love to hear your update about Harper's surgery. My baby girl, Kayla, is having the same surgery in January. Happy 8 Months, little cutie! Praying for tomorrow! Praying for Harper and the rest of your family. He is the ultimate doctor/surgeon/caregiver/comforter...He is the great I AM. Praying for her procedure (and all the others!!) Are you guys feeling better? I just got over strep throat. . .thankfully, my husband wasn't sick. I don't know what we would have done with little missy if we were both ill! She is getting so big! I will be thinking of you all tomorrow during her surgery. I hope your hospital employs Child Life Specialists because they really are crucial and important to help ease the stress on both you and Harper! She is beautiful!! What a blessing she is. I will be saying many prayers tomorrow!!! Good luck with her surgery! Both my little girls have had surgeries, and trust me, it's harder on the mommy than it is on the baby! Hugs! Happy 8 months, Harper! You don't even know it, sweet girl, but you and your momma bring smiles to so many faces everyday! Hope the surgery goes well (I know it will!). just thought you might like to know that "paapa" in the South Indian language - Tamil, means baby!!!! and usually used for baby girls!!!!! I love these updates! I do the exact same thing myself...but I am with you it is getting harder and harder to do the sign w/ my daughter b/c she keeps grabbing it and crawling/rolling away during picture time...so frustrating, but so cute at the same time! Happy 8 Months Old Harper! You are such a joy and beauty. I wish I lived closer I could meet you and your mom in person--you are wonderful people. I will be praying for you all--God is with you! Have a wonderful day! Happy 8 months Harper! Now it is time to start planning for her party :) I will be praying for her surgery tomorrow. I can't believe she's already 8 months old! I remember reading your blog and waiting for you to have her. She is so precious and I just want you to know that I think you are doing an amazing job. You're a wonderful Mommy and I can see just by the sound of your voice in the few videos you've posted and the sweet things you say about her all the time how much you love her. You encourage me to remember why I love being a Mommy! I'll be praying for Harper today, Kelly! (Is the surgery today?) I was going to ask "what surgery?" since I scrolled down through all your recent posts and didn't find any mention of it, but as I was going through your comments for hints, I saw that maybe she is having a tonsillectomy. Is that right? I will be praying for her safety during surgery, that she will heal well and quickly and that she won't be in much pain while she does. Oh, and I will be praying that you and Scott feel peace throughout the whole experience. Praying for a perfect surgery tomorrow. My little grandson is 22 months today. It does go so fast. I love your blog. Harper is getting so big. 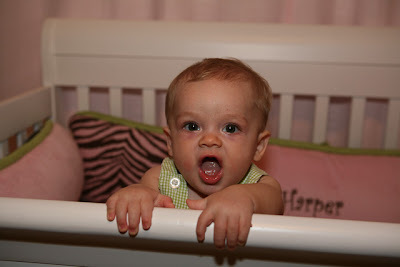 Maybe you should think about lowering the crib, they can pull themselves up so fast. She's a cutie! I am so glad you are a happy, healthy girl! I Love you! You are such a good momma! Even though she isn't smiling, her pic is still cute! Hey Kelly, I missed the post about what I'm thankful for, and I wanted to share something with you. When I first started reading your blog, there was a Blogher ad for a celiac disease foundation where you could take a little quiz to see if you might have celiac disease. I took the quiz and I answered yes to most of the questions, so I went to the dr. and got diagnosed. I went through ten years of abdominal pain and discomfort, with a lot of doctor's visits and missed diagnoses. Everyone missed it. So I am thankful for Kelly's Korner because it led to me being pain-free, at long last!! My life has been transformed. And you have been a part of that. Besides, I have been encouraged by your ministry. God bless! 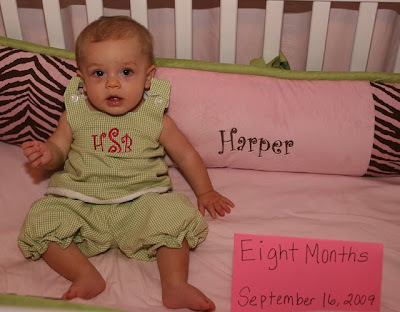 Happy 8th Monthday, Harper! My little girl loves to play with her monthday signs, too. This time around, I had to photo shop the sign in. WOW! Where does the time go??? It seems like we were just hearing that she was finally here! Happy 8 months! It doesn't seem like she should be that old yet - time is flying! Hope everything goes well tomorrow. Happy 8 month big girl! I can't believe how much you have grown and changed! When I look at her pictures now and I think she is even more adorable then before because I know the little personality that's behind those pictures! Such a doll! I've been praying that everything goes exceptionally well. Stay strong through this hard time! I love the way you have a picture of her from every month in her crib. I am such a bad mommy! I am pregnant with #5 and have never done that. I will with this baby for sure! She is adorable Kelly! Such a little sweetie. How she is growing. It's been amazing to watch. Praying for a smooth surgery for Harper and other children going through procedures tomorrow! We will be praying! Don't they get more and more fun every day?!?! She is so precious! I love her outfit!!! We'll be saying lots of prayers for Harper's surgery tomorrow. Looking forward to seeing an update. Stay strong Mommy & Daddy. She is just precious, Kelly, and truly, every age is wonderful, so just set your mind that it will be- there will be "opportunities" during each stage to grow in grace, but just anticipate and pray for wisdom and enjoy every minute of her! She is precious and starting to get some hair! They grow so quickly huh! I just wanted to let you know I love that in the collage of her "month" pictures she is wearing an outfit with her name (well, initials on one)! She is such a well dressed baby! She is absolutely precious! I love the collage from month to month. What a sweet little girl. We'll be praying for y'all tomorrow! Harper is growing so beautifully! I will be praying for her surgery tomorrow and I will also be praying for all other children undergoing medical treatment. She is such a cutie! Praying for you guys tomorrow, as well as all of the others on the prayer list. Happy 8th month Birthday Harper, you are just beautiful and I know that you are so loved by your mommy and daddy!!! I will be praying for you tomorrow. I hope that it goes by fast and you have as little pain as possible! Harper will be in my prayers tomorrow! Wow! it is amazing to see how much she has grown when you put the pictures together like that! By the way, my Benjamin is turning 8 months in 3 days! She is just so darn precious!! I will be praying for her tomorrow! Kelly, I will be praying for little sweetheart tomorrow and for you and Scott. I would be easier if it were you having surgery than your baby. I always cried when mine got shots or got hurt. It's a Mama thing. The monthly collage is so cute. Amazing to see how she is changing. Her hair is looking good. Next month she will hold the sign for you. What a cutie. Saying prayers for Harper and all other children who are in need of prayers tomorrow and every day. She'll do great!! I love how you keep a photo journal on here for her each month. It is beautiful! I've been a lurker for a long time. Just thought I'd say hi! Harper is adorable. Praying for everything to go okay tomorrow. Believe me, the time just goes by faster and faster. Mine are 8,6, and 4. Sometimes, it seems just like yesterday they were all as little as Miss. Harper! She is beautiful. I love reading your post. Hope everything goes smooth tomorrow! It is so neat to watch Harper grow. I am definintly going to do those pictures with our next baby. I'm loving the picture of Harper grabbing the sign! She's probably thinking "we do this every month so what exactly does this thing say? I think somebody needs to let ME know!" Such a sweetie! Girl, I'm laughing out loud b/c you mentioned that sweet Harper says "Da-da". My Henry (8 1/2 months) only says "ma-ma"! I walked into our room and my husband had Henry and was whispering "Da-da" to him! Henry just smiled! Harper will be in my thoughts tomorrow. Best wishes! Hope everything goes well tomorrow. She looks so cute in these photos. I can't believe she has grown so much over the past 8 months! Harper is growing up right before our eyes. She gets cuter with every picture. I'll say a prayer for you both for her surgery! Sweet baby! I will be praying for Harper and others tomorrow who will be having medical procedures. I'll be praying for you all tomorrow! Such a big, beautiful girl!! My mom called me Curious George when I was a baby! I've never heard of anyone else being called that. Harper is adorable. I have been reading your blog for awhile and thought I should say hi. Saying a special prayer for Miss Harper & her surgeon(s)/nurses tonight & tomorrow! I will definitely pray for sweet Harper tomorrow. Is this her little toe surgery? You are so sweet to pray for so many others - who you don't even know! Thank you for praying for little Walker -I've seen you left comments on his site. His mom was in my pledge class and she really is a fighter! Isn't her attitude through all this amazing? Happy 8 months, Harper! Praying her surgery goes well. She is just the most precious little thing! I love her! I'll be praying tomorrow! have a great day. Good luck with surgery tomorrow. I am Peds ICU nurse and know that it can be difficult but Harper will be just fine! I will be saying prayers for Harper and you today! Think positive, things will be just fine! Harper is getting so big and is so CUTE!! Under the weather is right. I thought we lived in NWA not Seattle. Blah,,, Harper is so cute!!!!! Time sure does fly. Praying that you and Scott get better soon and that Harper's surgery goes well today. Hi! I am some what of a blog stalker of yours...I hate admitting that to people. :) I have a 10 1/2 month old baby girl, so I love checking out what's new with Harper (not to mention drooling over her clothes and her mama's ruffly dresses)! I had to comment because we do monthly pictures in the chair in Adalee's room with a sign. From about 7 months on, it has been nearly impossible to keep her from eating the sign. We just did our 10 month chair pics and I don't think I got one decent picture of her and the sign. She was all over. I love them because they are so hilarious! So be prepared, it just gets worse! They are so precious though. Someone did give me a helpful hint that worked a time or two...glue your paper on to a piece of cardboard. She can hold it or play with it without wadding it all up (or if she's like mine, eating it)! I hope Harper's surgery was a breeze for both of you! 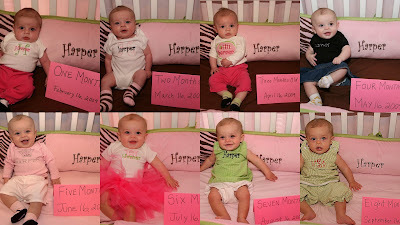 Can you share how you get Harper's photos in collage format on your blog? (like the monthly comparison shots) I have been trying to figure out how to do it and have not been able to. I know you know this, but she is a cutie pie!! !